Our personalized Baptism picture frame is personalized with the full name of the person, Christened/Baptized/Dedicated, and the details. The picture frame holds a 2x3 photo. 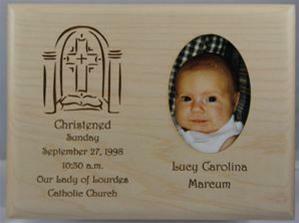 Each Frame is Personalized with the following information: Person's Full Name, Baptized/Christened/Dedicated, Day of Week, Date, Time, Church (or location) of ceremony. Frame can only be ordered in Landscape mode.